Now that the "boring" bench planes have been enumerated (there's more, but they're later in the numbering sequence), it's time to look at some of the more interesting specialty planes. #39 Dado plane, 8"L, various widths (see below), 1 3/4lbs-2 1/4lbs, 1902-1952. These planes, 8 all together, are designed to cut a dado, a trench across the wood's grain, and are the metallic versions of the earlier wooden ones. 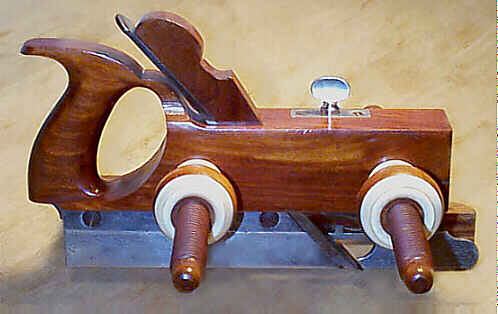 Like the wooden dado planes, a wooden batten must be laid aside the dado's position to guide the plane. An adjustable depth stop regulates how deep into the wood's surface the plane will cut. These planes can be used left or right handed, just like the wooden ones, an example of which is illustrated immediately below. All the planes have their blades set at a skew, with two adjustable spurs forward of the blade to score the wood (across the dado's width) before the blade makes its cut. The skewed iron facilitates cutting across the grain by yielding more of a slicing cut than there otherwise is were the blade not skewed; the compression of one fiber against another is minimized with a skewed iron where the compression is spread out over several fibers in the path of the iron whereas with a non-skewed iron the compression is placed on a single fiber in the path of the iron. But, more on the dado cutting action later. I don't like these planes at all, not because they're metallic planes, but because they are difficult to put any bearing pressure on their toes. There simply isn't a nice surface for your forward hand. Instead, the metal depth adjustment screw, as well as the tops of the spurs, stick up from the top of the plane, which physically hurts your hand as the plane is used. This isn't that much of a hindrance when the planes are used on softer woods, but they're downright bloody when using them on hardwoods. They also have the disadvantage of being more expensive than the wooden ones, but their soles don't warp like the wooden ones can. Regardless whether you prefer the metal or wooden dado planes, they both cut fabulous dados, and amaze dado'ers of the 'lectrical persuasion with their simplicity and results. The swell thing about dado planes in general is that you can taunt normites by asking them how they would cut a dado 45 degrees from the edge of the stock using their beloved stack dado cutter, and then watch them go through the dog and pony show of rigging up some fancy jig to try and pull it off. With these planes, you can bury them in the shavings that'll pile up by the time they make their first cut. The planes came in the following widths (not all planes were available during each year of production) - 1/4", 3/8", 1/2", 5/8", 3/4", 13/16", 7/8", and 1". The earliest models don't have their number and size embossed on their left side, but, instead, have them both cast into separate ovals on the right side, which is machined flat, with the backgrounds around the number and size being japanned. On these models, the number (cast as "NUMBER 39" forward of the handle) and size (cast near the toe) are embossed in separate shallow depressions, which probably proved difficult to cast with any regularity. The number and size were soon relocated to the left of the plane. The patent date is cast into the handle on the first and subsequent models, but was later replaced with just "STANLEY" cast into the handle starting around the sweetheart era (ca. 1920). All of the planes have their size cast on them, except for one, the 13/16" model. This is because this plane was made from a 7/8" size, which was then ground narrower to 13/16". The 7/8" marking was ground off the plane before it was japanned, but the "No. 39" remained on the casting. This is one of the rarest Stanley planes (think about it, how many applications do you know where a 13/16" dado is used?). Because of its rarity, some clever latter day toolmakers have attempted their hand at making the product, so be very careful of those that have been re-ground recently. There should be a circular mark where the 7/8" mark was ground off, if it is an original 13/16". However, the good faker can make this mark, too. Check the japanning in the area of the removed mark to verify its authenticity. Caveat emptor on this one! These planes, while overall ruggedly built, can often be found with broken parts. Of those that are damaged, it's usually a broken or missing spur or the lever cap snapped off below its pivot point. The lower edge of the lever cap can chip, but how that happens is beyond me, unless the dude was planing granite or something like that. Check that the depth stop isn't broken down where the stop's adjusting screw threads into it - they can break out around there. These are obvious problems that stick out like a sore thumb. The planes are often found missing their cutters. Finding replacements for them is tough since the cutters are unique to the series. They have bevelled edges and flare out on their right edges. The spurs are held to each side of the plane with two screws each; one screw, the lower one, is countersunk so that it sits flush with the spur, while the upper larger screw sits above the spur. Missing spur screws is a common problem with these planes. Most of the spurs are unique to the size of plane for which they were designed, so salvaging them can be a problem. However, the rightmost spur, since it's flat, unlike the leftmost ones that are bent to each size plane, can be pilfered from other planes as all the planes of the series are machined flat on their right sides. The most common damage to the spurs, other than their being used up, is a crack about the lower screw, near the business end of the spur. One other thing to be watchful for, as any dealer or collector of these planes knows all too well, is that the spurs are not interchangable between the earlier and later types; the earlier ones are narrower than the later ones, and the slots that they fit into are sized accordingly. If handcut dados are in your future, you may want to consider getting the #46 since its purchase price is considerably less than buying the series of the #39s. Plus, the #46 is more versatile as it can plough, rabbet, and match. However, if you know you're only going to work 3/4" stock, for example, then buying the #39 3/4 is more economical than buying a complete #46. For any dado plane, wooden or metallic, to work correctly, the nickers need to be set just a hair deeper than the cutter. The nickers need to score the wood fibers prior to the cutter lifting the shaving. 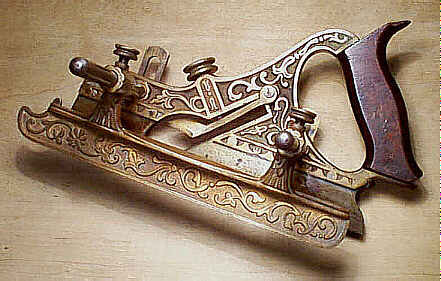 The edges of the cutter must be aligned with the line scored by the nickers otherwise ratty shoulders result. If the plane binds during use, a misalignment between the nickers and cutter may be the reason. It also may be from an improperly ground cutter, where the edges themselves flare out just a hair causing them to drag along the shoulders. These edges do not need to be beveled back so that the width of the bevel face of the cutter is narrower than the face's. This is a common misconception, and the plane will work fine if the widths of both faces are the same. When the cutter and spurs are set just right, you can peel off crossgrain shavings of a length equal to the length of the dado and leave the adoring public speechless over a feat thought impossible by the paint by number woodworkers out there. And for those who are into the great mysteries of life, like what's the opposite of bread, one can contemplate forever over how Stanley got the depth stops on these planes. It's sorta like Stanley's version of the Rubic's Cube. #40 Scrub plane, 9 1/2"L, 1 1/4"W, 2 1/8lbs, 1896-1962. 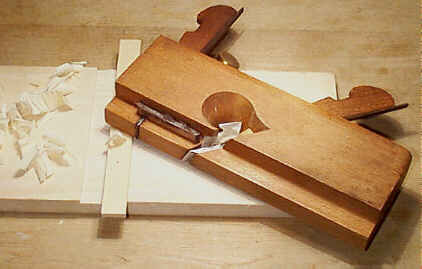 This is Stanley's version of a scrub plane, designed to remove a lot of wood quickly. It has a very thick blade (without a cap iron) which is ground convex, and a very wide mouth, all of which make the act of removing large amounts of stock, sometimes called "hogging", happen easily. The plane has a knob and a tote, both made of beech. The tote looks like the common beech tote used on the transitional planes, but the knob is shaped differently - it's much taller, and resembles the rosewood hi-knob version used on the metallic bench planes. The earliest knob is rather shapely, and has a fast taper to its diameter where it meets the casting. There are some examples of this tool with rosewood knobs and totes, but they are later models and seem to be scarcer than those equipped with beech. The switch from beech to rosewood may have had something to do with Stanley finally dropping the beech transitional planes during WWII; they no longer needed to buy beech, and were content just destroying the rainforests. The finish on the rosewood is very thick, and it often obliterates the wood's grain. The WWII years used the common dark-finished hardwood knob and tote that was used on the bench planes. There are two basic castings used for these planes. The earlier of the two has a narrow cross-rib cast between the two arched sides of the tool. It's on this cross-rib that the iron seats, lending support when the lever cap is tightened. Because of the plane's design, the lever cap screw sits above the cross-rib, and can make the iron flex a bit when clamped in place. Stanley redesigned the iron's seat, making it T-shaped so that the lever cap screw sits directly over the casting, which acts as a buttress. Check that the lever cap screw can tighten the blade - sometimes the screw can bottom out before applying enough pressure on the blade. Also check that the lever cap itself hasn't been snapped in two, and then repaired. The plane's main casting is entirely japanned, except for the sole. Scrub planing wood can be hard work, which often generates rivulets of sweat dripping down your forearms onto the plane. Sweat and bare metal don't make a happy couple, so Stanley may have japanned their exteriors to keep the plane spiffy looking as long as possible. Most examples of the plane, however, exhibit a ghastly appearance from years of toil. These planes are hard to ruin physically since they're quite ruggedly built to handle the job for which they are designed. If you're at all into preparing rough stock, this is one plane to own. Even the most die-hard power tool junkie can successfully use this plane, but be careful if you fall into that gene pool - it might just be your baptism into the spiritual world of handtool fundamentalism. #40 1/2 Scrub plane, 10 1/2"L, 1 1/2"W, 2 1/2lbs, 1902-1948. Same as the #40, only a bit larger, and much less encountered. Check that the lever cap's width is equal to the iron's to ensure that it isn't a replacement from the narrower #40. 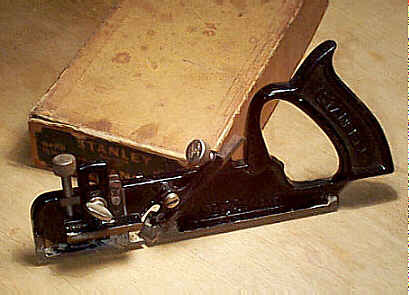 This is the first in a series of combination planes that Stanley introduced in an attempt to counter the wooden plane equivalent that had become the standard for this type of work. 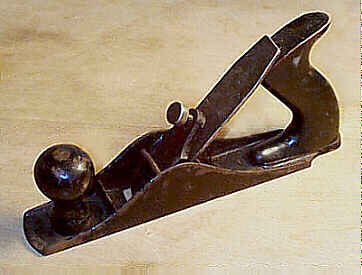 Its primary function is as a plough plane. This plane is beatifully cast with floral scrollwork on its body, fences, and fillister bottom and is a fine example of Victorian extravagance that permeated design and form no matter the object. 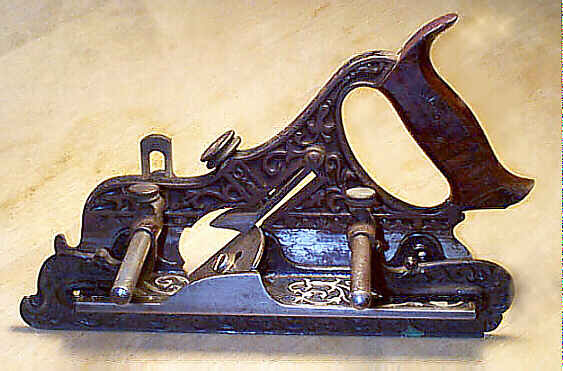 This was a calculated act on Stanley's part, due to the competition with the wooden ploughs that were often the showpiece of the master cabinetmaker - wooden ploughs at this time were often made of an exotic wood, most often boxwood and/or rosewood, and were sometimes decorated with ivory trimmings. Had Stanley introduced this plane as just a chunk of metal, which they easily could have, it likely would have suffered a different fate - surely no workman was going to turn in his fancy wooden plough for some unsightly chunk of metal. Many of them did bite on the bait, transforming wood into metal, and Stanley sold a considerable number of these planes. The plane has a nicely finished rosewood tote, which is stamped with Miller's patent date on its left side. The tips/horns of these totes are often broken since they extend back a great deal with little to support them other than the wood's grain (later models of the plane overcame this defect simply by making the tote with smaller horns). The totes are fastened to the cast frame with pins. The earliest models use two pins to fasten the tote to the frame, whereas the later ones use only a single pin. Frequently, the totes are cracked in two around the pins or have tote chunks missing about the pins. 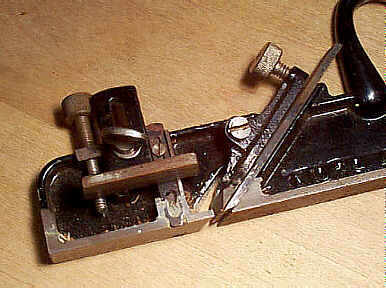 The earliest models, often called "humpbacks", have a pronounced hump starting just behind the screw that activates the brass lever cap (doubles as a chip deflector) to secure the iron in place. The hump terminates with a graceful, looping, and hook-like return at the top of the tote. The later models have more of an S-shape from the screw to the tote. 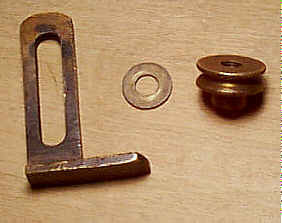 There are also other ways to date these planes, such as the type of screws used on them (brass surrounding a slotted round-headed screw vs. all brass screw vs. slotted brass screw), the fence style (two fences vs. one fence with two sets of holes), the chip deflector (stubby and angular vs. larger and curvilinear), the endpoints of the arms (turned acorn-like finials vs. simple rounding), and the slitting cutter (absent or present). Whatever the vintage of the plane, they all have the elaborate castings, but the earliest ones fetch the most moolah from collectors. The plane came with the following irons - 8 plough irons, 1/8", 3/16", 1/4", 5/16", 3/8", 7/16", 1/2", and 5/8", a 1/4" tonguing iron, and a 1 5/8" fillister iron. The irons are very thick with a v-groove on their backsides into which the skate fits to grip and align them. These irons are very much like the typical wooden plough irons, but not nearly as long. Starting in 1884, a slitting cutter was added, which was used to slice thin sections of wood, a task commonly done skillfully by using a handsaw. This slitting cutter has a separate pressed steel depth stop that fits over it. The two of them fit over the rear arm, on the right side of the plane. A large brass nut, exactly like the one used for the depth stop, holds them in place by screwing onto the threads of the arm. The slitting cutter is held in place laterally by a machined recess in the plane's main casting. 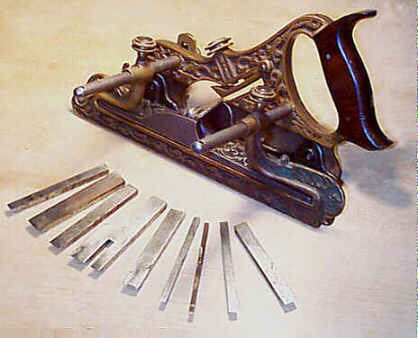 The slitting cutter and/or its depth stop are often missing from these planes. For a very brief time, a second brass depth stop, like that used on all models of the series, was supplied as the depth stop for the slitting cutter. Stanley, in its advertising literature about the planes, gave unique names to the fences that came with the planes. They called the ornately cast fillister fence the "gate", and the shorter fence the "gauge", which was an optional feature for this and the #42 planes. In deference to modern vocabulary, fillister fence and ploughing fence are used in the descriptions that follow. Since there are many subtle changes to the castings during the plane's production, one has to be careful about buying one for parts to complete one that is missing some. One of the more common problems with this plane is its delicately cast fillister fence, which can easily break if the plane is mistreated. This fence rides on two arms that are screwed into the plane's body. Usually, the distance the arms are apart from each other varies ever so slightly, which can make for a tough time to find a suitable fence replacement; the fence will fit onto the arms, but it can bind as it is slid closer to the body due to the misalignment of the fences holes and the position in the main casting where the arms are tapped. The chip deflector, which doubles as the bearing part to secure the iron, is made of brass and can break or bend along its length. It is secured to the plane with two screws. Many examples are missing a screw or have replacements. The earliest models used round-headed screws to attach the chip deflector, with the later ones using flat-headed screws. The depth gauge is made of brass, and it can sometimes get banged up making it difficult to slide along its entire length. The depth gauge slips over the the right portion of the forward arm, and a brass knurled nut, like that used with the slitting cutter, is screwed onto the arm to lock the gauge in position. A brass washer is proper to the depth stop and nut. The fillister bottom screws to the skate of the plane - there are two slots in the skate, one before the cutter and one behind the cutter, with each slot accepting its corresponding screw. Check that the screws aren't replacements. They should have flat heads, and fit snuggly into the slots provided them. The fillister beds are not interchangeable between the earlier and the later models; the position of the screws is just slightly different to allow proper alignment of the bed to the plane. The fillister bottom carries the wide fillister iron, which is set at a skew to the fillister bottom. A large slotted screw and a brass washer hold it in place. A spur is provided on the bottom, forward of the cutter, to score the wood's grain before the iron cuts it. 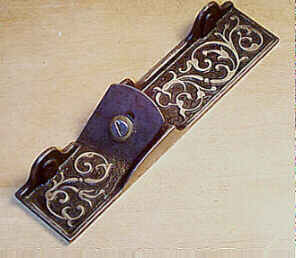 This spur is dovetailed in place, and often is frozen in place. Many planes are missing the fillister bottom altogether. If it is, and you're seeking a replacement, the line forms at the rear. The background of the castings is japanned, and the high points are machined flat, which combine to give the plane a striking appearance. 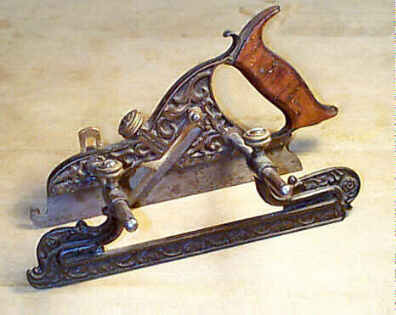 There is no number cast into the plane, but the skate, which is fashioned from steel and is pinned to the main casting, usually has the imprint of Stanley Rule and Level Co. stamped into the right rear of it. While looking for the company's logo, check that the casting, where it meets the rosewood handle, above and below, isn't cracked or repaired. Enough examples of the plane can be found equipped with the two fences, which offers ample proof that many woodworkers of the day had some money burning a hole in their pockets in order to incur the additional expense of the optional ploughing fence. The fillister fence is used along with the fillister bottom, but can be used without the fillister bottom during normal ploughing operations. The fillister fence has two looping areas that extend beyond the positions of the two arms so that it can fit over the fillister bottom and regulate the width of cut. The fence's length is a bit longer than the plane's skate. This is the fence that can be damamged easily. The other fence is shorter, a bit shorter than the plane's skate, and is used for general ploughing. Both fences have floral patterns cast into them, but the fillister fence is more ornate. During the mid-1880's, the two fence version was dropped for a model that carried only one. The plane itself remained relatively unchanged (other than the addition of the slitting cutter), with the fence undergoing a redesign. The new fence has 2 sets of holes to receive the plane's arms, with one set directly over the other. The fence curves toward the plane's skate, so the top-most set of holes is used with the fillister bottom, and the bottom-most for normal ploughing. This fence is always iron (an important distinction for the plane that follows). This plane is identical to the #41, except that it is made from gun metal, an alloy of copper (88% copper, 10% tin, and 2% nickel), similar in appearance to bronze. Since this plane isn't made of iron, like the #41, it is somewhat malleable. Dropping it on a hard floor won't necessarily break it, like an iron one is apt to suffer. Instead, the metal will bend a bit before it breaks, so check for ones that have been mistreated by sighting down its skate - it should be perfectly straight. This plane, like the #41, can accept the same two fences as those that fit the #41. However, the fillister fence is cast of gun metal, and the ploughing fence is cast from iron. Never accept one that has two iron fences. As is the case with the #41, the plane is most often found with a single fence, and a missing fillister bottom (it's also fashioned from iron for this plane). There are reproductions fences out there, and they are rather easy to spot. They don't have the detail that the original does; the fine pebbled background on the portions that loop up to meet the holes for the arms is washed out and nearly smooth. The earliest models have their background japanned which gives the tool a striking appearance with the machined, unpainted high spots. Even the most powertool hungry wood processer would find this plane a joy to own. The humback models do not have the pronounced hook above the top of the handle, but it does have a slight hook that sets it apart from the later castings. The same basic design as the #41 except that the plane doesn't have the fillister bed and cutter. Therefore, there is only one fence provided on the plane. The easiest way to distinguish this plane from the #41 is to look for the two screw holes in the skate; this model doesn't have them. The earliest models of this plane, the ones of the humpback casting, provided the fillister fence, with some slight modification, as the standard ploughing fence. Since the fillister fence has looping ends to fit over the fillister bed, which isn't supplied with this model, they are filled in with iron to give it a bit more strength. They were cast this way, not modified after the fact. Stanley introduced the familiar and shorter ploughing fence when the humpback casting was dropped for the later style plane. These planes aren't as common as the #41, but because they don't have all the bells and whistles as the #41, namely the fillister bed and fence, they don't command as much money as the #41 does. Same as the #42 except it is made from gunmetal. The ploughing fence is cast from gunmetal as well. This fence is damn tough to replace if you need one. This is the rarest of the four models of Miller's ploughs. I can't say whether the filled-in fillister fence was supplied as the ploughing fence with this plane on the humpback models. I suspect it was, but that's not certain since this plane is rare enough as it is, and the early humpback models of any of these planes are rarer still. I've yet to see an example surface in a collection or show up for sale (public or private). Copyright (c) 1998-2012 by Patrick A. Leach. All Rights Reserved. No part may be reproduced by any means without the express written permission of the author.